William Tham’s impressive debut novel Kings of Petaling Street had me looking all around every time I stopped at a traffic light. After reading the book, it became imperative to check out the cars around me in case one of them was being driven by a gangster, so vivid and intense was Tham’s story of Wong Kah Lok, ruthless boss of one of Kuala Lumpur’s most powerful gangs. After his wife and older son are killed in a gang fight, Wong spends most of his declining energy trying to protect his younger son, Gavin, from the shady dealings of the syndicate he runs. But Wong’s second-in-command, Crazy Foo, takes the inexperienced Gavin under his wings and lands him right in the middle of their gang war. An assorted cast of colourful characters populate the book; including Ramalingam, the policeman who is still torn up over a grievous mistake he committed years ago; Maut, the two-timing assassin hired by both sides to decimate each other; Zahid, rising politician and chancellor of the university that Gavin attends, who has no compunction about using his criminal connections to get ahead; and Danielle, Gavin’s very respectable girlfriend. What starts off as seething gangland rivalry kept in check under a tight police lid quickly escalates into an all-out gang war that leaves many of the players dead. Not content with one main plot, Tham weaves an ever-dynamic chain of sub-plots and flashbacks into his story that keeps readers fully engaged, at the same time, sympathetic towards the characters. 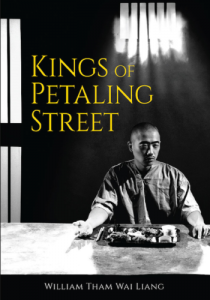 A dark banquet of the inner workings of Kuala Lumpur’s criminal underbelly, William Tham’s Kings of Petaling Street is a gripping and absorbing read. Published by Fixi London 2017.